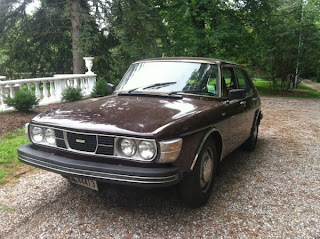 So, I'm now a Saab owner. (For the second time in my life.) That means that I have joined every Saab forum and subscribe to every Saab page. That's the way I am. Knowledge is power and all that stuff. This car was on my Facebook page this morning. It came via Saablime. 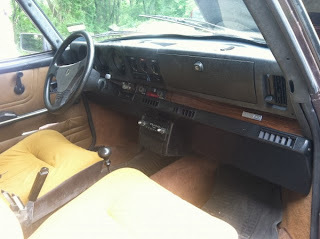 It's been well over a year since I last posted a car, but this was so cool, I had to write about it. It could be argued (and, I know, would be argued by 93 / 96 fans) that the 99 is the iconic Saab. Introduced in 1968, it was built, with minimal changes, until 1984. The classic 900, built from 1974 through 1994 (1994 in convertible form only), shared it's basic platform, design features and many parts with the 99. While the 99 was never a huge selling car in the US, it did well. It had a reputation for being safe, dependable and easy to work on. Its design "quirks" (i.e. "backwards" mounted engine, floor mounted ignition, center mudflaps) made it a favorite among car geeks. This is a basic 99 GL. Non-turbo. The seller claims it's a one owner car. It is rust free and the interior looks to be in nice shape. The seller says it has a cooling issue. 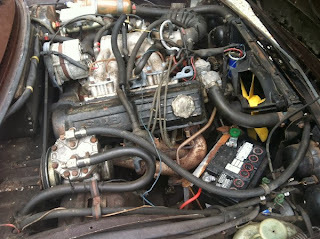 I would budget time and/or money for a head gasket job. Maybe it will be something simpler, but I always believe in thinking worst case scenario and being pleasantly surprised if it's not. 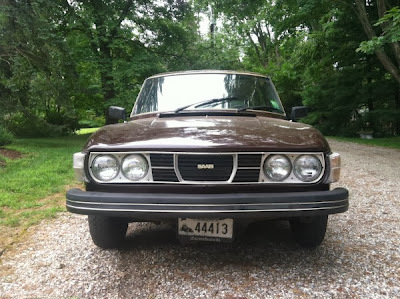 Granted, I've owned my latest Saab (a 1997 900 convertible) for less than a year and have had little go wrong with it (a bad motor mount being the biggest issue), but my experience getting parts through ex-Saab dealers has been less than great. However, there are some very good parts dealers online and, when all else fails, there is eBay (which is where I found my motor mount). The folks on the Saab Central forums are a valuable source of help and information. This car is located in Connecticut. The asking price is an incredibly reasonable $1000.00. You can find the ad on the Saab 99 Turbo Registry. I really like the 99, the C900 just has too much front overhang. Holy cow! Glad to see a new post. Yep, glad to have you back also... makes the working day go by that little bit faster! YIPPEE! Welcome back. Your appreciation for simple, real cars that real people can enjoy has been missed for so long. Obviously, it's hard work to keep up something like this but you have some real fans and I hope we see more of you. Thanks!! Thank you for coming back! I love this site, and learning about under appreciated cars from yesteryear.